There are several reasons why organizations should look for the best antispam program rather than the best antispam filter or best antispam solution. An antispam program does far more than just filter inbound emails. It also protects your network from email-borne threats such as malware, phishing attempts and malicious URLs, and – importantly – scans your outbound emails for spam and malware. Naturally, a high rate of spam detection is important, as is virus detection and email continuity. But several leading antispam solutions ignore the importance of outbound scanning – a factor that could impact the flow of communication with your customers if an over-zealous antispam filter identified one of your organization´s outbound emails as spam and your IP addresses was added to a global blacklist. To understand the importance of outbound scanning, it is first necessary to understand how inbound antispam filters work. In order to reduce the burden on mail exchangers, inbound antispam filters run front end tests on all incoming emails to quickly identify which ones are spam. One of these front end tests is a comparison of the sender´s IP address against a Realtime Blackhole List. The Realtime Blackhole List is effectively a global blacklist of known sources of spam. It is updated as new sources of spam are identified and shared between all inbound antispam filters. Consequently, if your organization´s IP address appears on this list, an email sent from your organization will be blocked by every antispam filter – including the ones used by Gmail, Outlook and Yahoo. It does not take a lot for an email to be identified as spam. A misspelled title of an email or the overuse of specific keywords within its content can cause an email to be identified as spam. An IP address can also be blocked if an email is identified as containing malware. It need not be the case that the malware has originated from your network. It could be the case that the malicious software is in an attachment prepared by an employee on his or her malware-infected home computer. The best antispam program has inbound antispam filters that do more than just rely on blacklist comparisons to identify spam email. Blacklist comparisons only block spam from “known” sources, which is why a small amount of spam from “new” sources evades detection on basic email filters such as those used by Gmail, Outlook and Yahoo. In order to identify spam from new sources, the best antispam program uses Bayesian Analysis and Greylisting. Bayesian Analysis inspects the content of an email to identify attempts to disguise words often associate with spam – for example the word “prize” spelled using the Icelandic symbol for thorn (“þ”). If the analysis suspects the email of being spam, it is sent for Greylisting. Greylisting involves the inbound antispam filter sending a request to the originating server to send the suspect email again. Spammers´ servers are too busy sending out spam to respond to the request and, after a predetermined period of time has elapsed with no response, the antispam filter classifies the suspect email as spam and quarantine´s it. Consequently, inbound antispam filters with Bayesian Analysis and Greylisting block spam from new sources as well as known sources. The best antispam program should not only be effective at scanning inbound and outbound emails for spam, but also at detecting email-borne threats. Two of the biggest email-borne threats to organizations are links to malicious websites and phishing attempts. The success of these threats relies on employees inadvertently clicking on a link they believe to be genuine or revealing their security credentials. Ensure your antispam filter conducts outbound scanning to prevent accidental blocking of your IP address. Ensure its filtering mechanisms include Bayesian Analysis and Greylisting to block spam from new sources as well as known sources. Ensure whatever antivirus software is installed is capable of malicious URL blocking and phishing protection to mitigate the risk from email-borne threats. SpamTitan offers organizations the best antispam program available. Our spam filtering solutions scan both inbound and outbound emails, use Bayesian Analysis and Greylisting to detect 99.97% of spam, and provide dual real-time antivirus protection – with malicious URL blocking and phishing protection – from industry-leading Bitdefender and ClamAV. SpamTitan Gateway is a robust virtual appliance that is installed between your organization´s firewall and your mail server. It is an infinitely scalable solution that has one of the best anti-spam catch rates from a selection of market leaders. SpamTitan Cloud is a versatile mail filtering solution that has three cloud-based hosting options for larger organizations and MSPs. Like SpamTitan Gateway, SpamTitan Cloud supports an unlimited number of users and multiple domains. For MSPs, SpamTitan Gateway and SpamTitan Cloud are available in white label formats to provide unmatched email security for your customers. Our best antispam program protects your network from rogue or hacked customers, and has an extensive API set available for integration with third-party management products. We believe that the best way to evaluate inbound antispam filters is to trial them in your own environment. In this respect, we invite you to try our best antispam program free for thirty days, with no obligation to purchase a license or subscribe to our service once the trial period has ended. Our offer includes a fully-enabled email filtering solution and all the help from our customer and technical support teams you need. To take advantage of this invitation, simply call our team of Sales Technicians today. 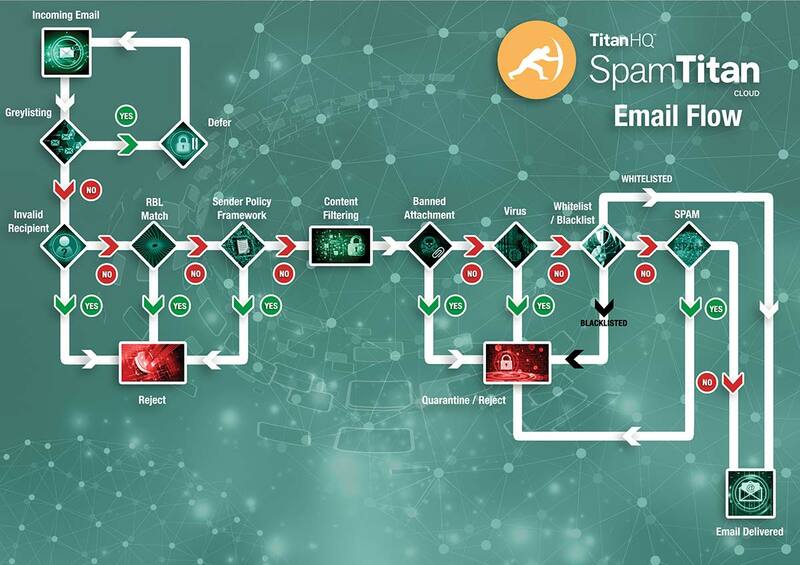 One of our team will be happy to answer any questions you have about inbound antispam filters and guide you through the process of installing and configuring the most appropriate SpamTitan solution. Within minutes you will be filtering inbound and outbound emails and mitigating the risk from email-borne threats.